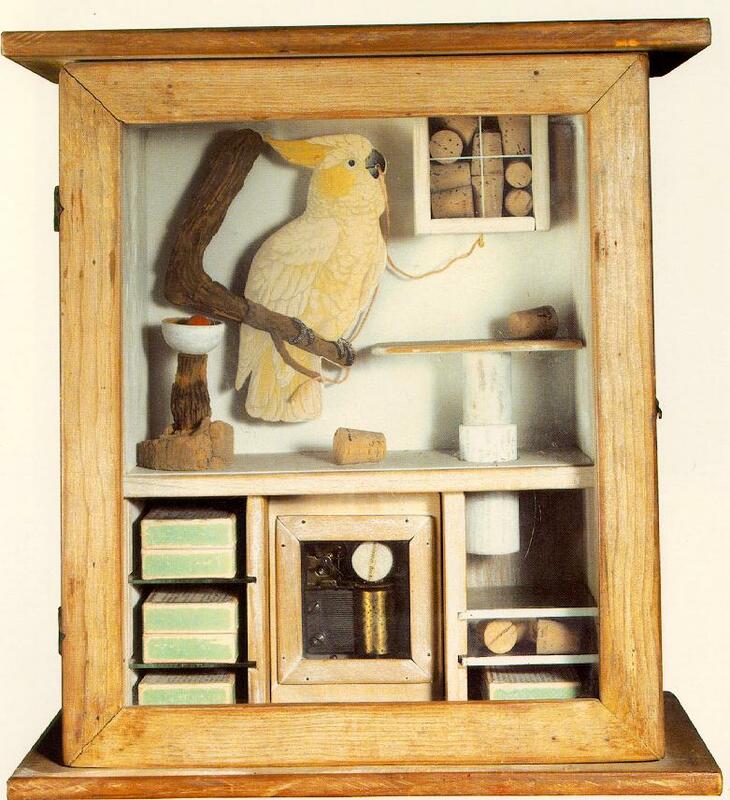 Joseph Cornell engaged in a collector’s practice in order to produce his sculptures. 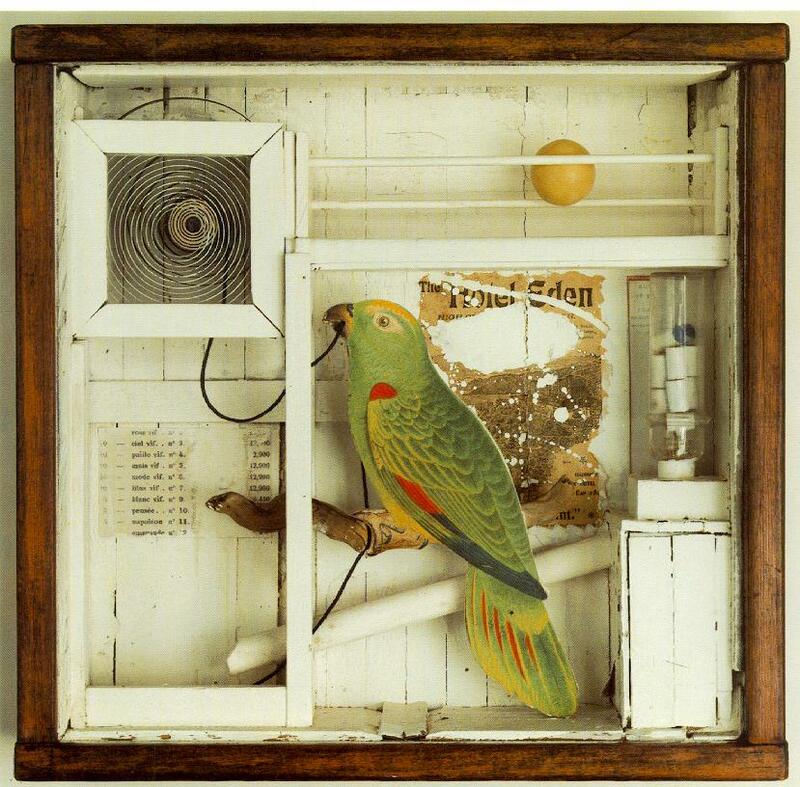 Cornell is most well known for his assemblages of objects in glass-fronted boxes, though he also created a number of experimental films made by splicing found film sequences. Throughout his life, Cornell maintained extensive collections of old photographs, recordings, movies, opera librettos, souvenirs, and other ephemera, as well as small objects. 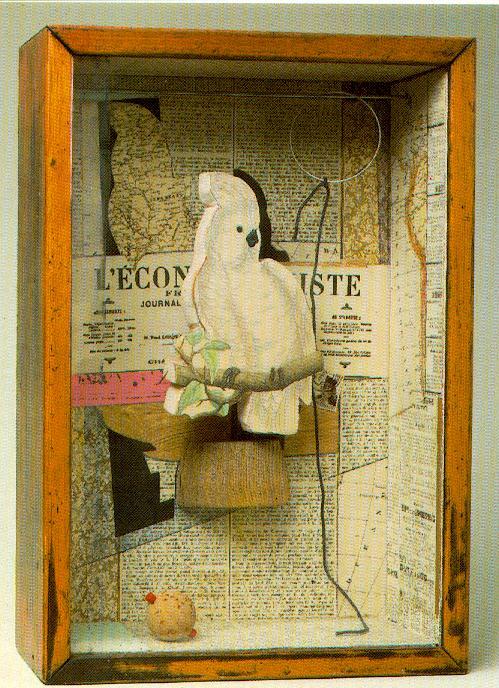 In his studio, he maintained something of a categorization system, in which boxes of his own correspondence, writings, and memories might be filed with collected objects under categories which describe the objects (“Spiders”, “Moons”, etc). Cornell has be associated with Surrealism, and while his associations and influences due tie him to particular Surrealist artists (Max Ernst, for example), Cornell developed a clear prohibition Surrealism’s “dark” side (namely eroticism and violence) in his work, stating that he was interested only in the “white magic” of Surrealism. In another break from Surrealism, Cornell expressed (in his diary) his admiration for the “ineffable beauty and pathos of the commonplace”. The Surrealists were typically interested in quite the opposite, that is, the bizarre and shocking, but Cornell’s interest is perhaps more in line with that of an archetypal collector. His faith that in commonplace objects we can see and feel things as vast as “ineffable beauty and pathos” might well be shared by many who hold that collected, saved found objects can carry intense weights of meaning and association. Cornell’s collections function as visual vocabulary from which he can draw instances and create associations, adjacencies, and phrases. His display format is established and consistent, yet varied from piece to piece. The glass-front box form creates a museological or curio-cabinet-type experience of these works. The lack of clear, pointed communication of educational information in these cabinets, however, turns the experience from one of looking into a sealed, objective view of history to a significantly more dreamlike, nostalgic personal psychology, an experience of subjective memory and association. Many of Cornell’s boxes were dedicated to stars, ballerinas, and singers whom he admired but had not met, or trips to places he had never taken. Cornell would also organize screenings of films from his collection, which may have led directly to his practice of cutting, resplicing, and collaging found film to generate his own experimental film works. Salvador Dali famously attended the premier of a Cornell film, overturned the projector, and admonished Cornell for stealing “his idea” (which he had not told anyone let alone enacted yet) of collaging in film. 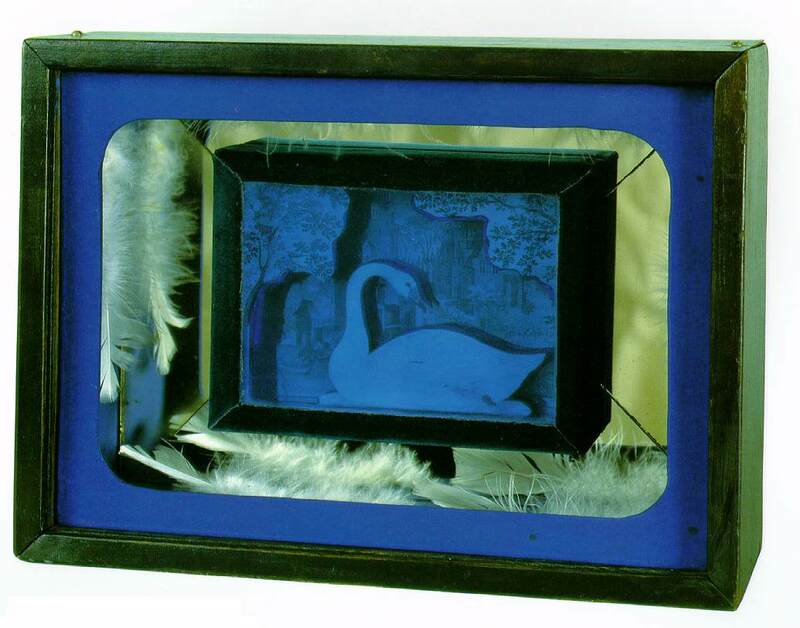 In his film, Rose Hobart, Cornell may have used the persistent blue filtering of the image as quite the same strategy as the glass in his boxes; a separation between the viewer and the objects of Cornell’s collection creates a distance which both raises their importance to the level of the museum, and yet makes them untouchable and ineffable like the components of dream or memory.